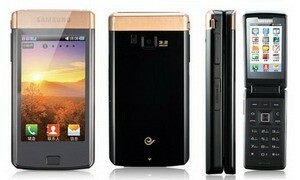 A new Samsung clamshell phone with bada OS has been revealed - it is Samsung SCH-W689. What's interesting about the Samsung's first bada-powered flip phone is it has two touchscreen displays as well as dual-SIM support (GSM and CDMA). Samsung SCH-W689 features bada 1.1 platform, a 455MHz processor, 3.2MP camera, alphanumeric keypad, GPS, 3G EV-DO Rev. A, Wi-Fi, Bluetooth 3.0, 1500mAh battery, and a microSD memory card slot. Samsung SCH-W689 bada clamshell phone is a China-only phone at the moment. 0 comments on "Samsung SCH-W689 bada clamshell with 2 SIM card slots, two touchscreens"